In my previous articles I have discussed some of the key foreign challenges that Russia now faces. This subject deserves a more detailed discussion and not just because foreign policy is part and parcel of any government strategy. External challenges and the changing world around us are compelling us to make decisions that have implications for the economy, our culture, the budget and for investment. Russia is part of the greater world whether we are talking about the economy, media coverage or cultural development. We do not wish to and cannot isolate ourselves. We hope that our openness will result in a higher standard of living for Russia plus a more diverse culture and a general level of trust, something that is becoming increasingly scarce. However, we intend to be consistent in proceeding from our own interests and goals rather than decisions dictated by someone else. Russia is only respected and considered when it is strong and stands firmly on its own feet. Russia has generally always enjoyed the privilege of conducting an independent foreign policy and this is what it will continue to do. In addition, I am convinced that global security can only be achieved in cooperation with Russia rather than by attempts to push it to the background, weaken its geopolitical position or compromise its defenses. Our foreign policy objectives are strategic in nature and do not proceed from opportunistic considerations. They reflect Russia's unique role on the world political map as well as its role in history and in the development of civilization. I do not doubt that we will continue on our constructive course to enhance global security, renounce confrontation, and counter such challenges as the proliferation of nuclear weapons, regional conflict and crises, terrorism and drug trafficking. We will do everything we can to see that Russia enjoys the latest achievements in scientific and technical progress and to assist our entrepreneurs in occupying an appropriate place on the world market. We will strive to ensure a new world order, one that meets current geopolitical realities, and one that develops smoothly and without unnecessary upheaval. As before, I believe that the major principles necessary for any feasible civilization include indivisible security for all states, the unacceptability of excessive use of force, and the unconditional observance of the basic standards of international law. The neglect of any of these principles can only lead to the destabilization of international relations. It is through this prism that we perceive some aspects of U.S. and NATO conduct that contradict the logic of modern development, relying instead on the stereotypes of a block-based mentality. Everyone understands what I am referring to – an expansion of NATO that includes the deployment of new military infrastructure with its U.S.-drafted plans to establish a missile defense system in Europe. I would not touch on this issue if these plans were not conducted in close proximity to Russian borders, if they did not undermine our security and global stability in general. Our arguments are well known, and I will not spell them out again, but regrettably our Western partners are irresponsive and are simply brushing them aside. We are worried that although the outlines of our "new" relations with NATO are not yet final, the alliance is already providing us with "facts on the ground" that are counterproductive to confidence building. At the same time, this approach will backfire with respect to global objectives, making it more difficult to cooperate on a positive agenda in international relations and will impede any constructive flexibility. The recent series of armed conflicts started under the pretext of humanitarian goals is undermining the time-honored principle of state sovereignty, creating a void in the moral and legal implications of international relations. It is often said that human rights override state sovereignty. No doubt about this – crimes against humanity must be punished by the International Court. However, when state sovereignty is too easily violated in the name of this provision, when human rights are protected from the outside and on a selective basis, and when the same rights of a population are trampled underfoot in the process of such "protection," including the most basic and sacred right – the right to one's life – these actions cannot be considered a noble mission but rather outright demagogy. It is important for the United Nations and its Security Council to effectively counter the dictates of some countries and their arbitrary actions in the world arena. Nobody has the right to usurp the prerogatives and powers of the UN, particularly the use of force as regards sovereign nations. This concerns NATO, an organization that has been assuming an attitude that is inconsistent with a "defensive alliance." These points are very serious. We recall how states that have fallen victim to "humanitarian" operations and the export of "missile-and-bomb democracy" appealed for respect for legal standards and common human decency. But their cries were in vain – their appeals went unheard. By definition, absolute invulnerability for one country would in theory require absolute vulnerability for all others. This is something that cannot be accepted. Many countries prefer not to be straight about this for various reasons, but that's another matter. Russia will always call a spade a spade and do so openly. I'd like to emphasize again that a violation of the principle of unity and the indivisibility of security – despite numerous declarations committing to it – poses a serious threat. Eventually these threats become reality for those states that initiate such violations, for many reasons. A year ago the world witnessed a new phenomenon – almost simultaneous demonstrations against authoritarian regimes in may Arab countries. The Arab Spring was initially perceived with a hope for positive change. People in Russia sympathized with those who were seeking democratic reform. However, it soon became clear that events in many countries were not following a civilized scenario. Instead of asserting democracy and protecting the rights of the minority, attempts were being made to depose an enemy and to stage a coup, which only resulted in the replacement of one dominant force with another even more aggressive dominant force. Foreign interference in support of one side of a domestic conflict and the use of power in this interference gave developments a negative aura. A number of countries did away with the Libyan regime by using air power in the name of humanitarian support. The revolting slaughter of Muammar Gaddafi – not just medieval but primeval – was the incarnation of these actions. No one should be allowed to use the Libyan scenario in Syria. The international community must work to achieve an inter-Syrian reconciliation. It is important to achieve an early end to the violence no matter what the source, and to initiate a national dialogue – without preconditions or foreign interference and with due respect for the country's sovereignty. This would create the conditions necessary for the Syrian leadership-announced measures on democratization. The main objective is to prevent an all-out civil war. Russian diplomacy has worked and will continue to work towards this end. Sadder but wiser, we are against the adoption of UN Security Council resolutions that may be interpreted as a signal to armed interference in the domestic developments of Syria. Guided by this consistent approach in early February, Russia and China prevented the adoption of an ambiguous resolution that would have encouraged one side of this domestic conflict to resort to violence. The logic of such conduct is counterproductive and very dangerous. No good can come of it. In any case, it will not help reach a settlement in a country that is going through a domestic conflict. Even worse, it further undermines the entire system of international security as well as the authority and key role of the UN. Let me recall that the right to veto is not some whim but an inalienable part of the world's agreement that is registered in the UN Charter – incidentally, on U.S. insistence. The implication of this right is that decisions that raise the objection of even one permanent member of the UN Security Council cannot be well-grounded or effective. I hope very much that The United States and other countries will consider this sad experience and will not pursue the use of power in Syria without UN Security Council sanctions. In general, I cannot understand what causes this itch for military intervention. Why isn't there the patience to develop a well-considered, balanced and cooperative approach, all the more so since this approach was already taking shape in the form of the afore-mentioned Syrian resolution? It only lacked the demand that the armed opposition do the same as the government; in particular, withdraw military units and detachments from cities. The refusal to do so is cynical. If we want to protect civilians – and this is the main goal for Russia – we must bring to reason all participants in an armed confrontation. Generally, the current developments in the Arab world are, in many ways, instructive. They show that a striving to introduce democracy by use of power can produce – and often does produce –contradictory results. They can produce forces that rise from the bottom, including religious extremists, who will strive to change the very direction of a country's development and the secular nature of a government. The Arab Spring has graphically demonstrated that world public opinion is being shaped by the most active use of advanced information and communications technology. It is possible to say that the Internet, the social networks, cell phones, etc. have turned – on par with television – into an effective tool for the promotion of domestic and international policy. This new variable has come into play and gives us food for thought – how to continue developing the unique freedoms of communication via the Internet and at the same time reduce the risk of its being used by terrorists and other criminal elements. I'm referring to those cases where the activities of NGOs are not based on the interests (and resources) of local social groups but are funded and supported by outside forces. There are many agents of influence from big countries, international blocks or corporations. When they act in the open – this is simply a form of civilized lobbyism. Russia also uses such institutions – the Federal Agency for CIS Affairs, Compatriots Living Abroad, International Humanitarian Cooperation, the Russkiy Mir Foundation and our leading universities who recruit talented students from abroad. Developments around the Korean nuclear issue are no less serious. Violating the non-proliferation regime, Pyongyang openly claims the right to develop "the military atom" and has already conducted two nuclear tests. We cannot accept North Korea's nuclear status. We have consistently advocated the denuclearization of the Korean Peninsula – exclusively through political and diplomatic means -- and the early resumption of Six-Party Talks. However, it is evident that not all of our partners share this approach. I am convinced that today it is essential to be particularly careful. It would be unadvisable to try and test the strength of the new North Korean leader and provoke a rash countermeasure. All this fervor around the nuclear programs of Iran and North Korea makes one wonder how the risks of nuclear weapons proliferation emerge and who is aggravating them. It seems that the more frequent cases of crude and even armed outside interference in the domestic affairs of countries may prompt authoritarian (and other) regimes to possess nuclear weapons. If I have the A-bomb in my pocket, nobody will touch me because it's more trouble than it is worth. And those who don't have the bomb might have to sit and wait for "humanitarian intervention." Whether we like it or not, foreign interference suggests this train of thought. This is why the number of threshold countries that are one step away from "military atom" technology, is growing rather than decreasing. Under these conditions, zones free of weapons of mass destruction are being established in different parts of the world and are becoming increasingly important. Russia has initiated the discussion of the parameters for a nuclear-free zone in the Middle East. If the incentives for becoming a nuclear power are finally eradicated, it will be possible to make the international non-proliferation regime universal and firm based on the existing treaties. This regime would allow all interested countries to fully enjoy the benefits of the "peaceful atom" under IAEA safeguards. Russia would stand to gain much from this because we are actively operating in international markets, building new nuclear power plants based on safe, modern technology and taking part in the formation of multilateral nuclear enrichment centers and nuclear fuel banks. The dimensions of the Afghan drug threat make it clear that it can only be overcome by a global effort with reliance on the United Nations and regional organizations – the Collective Security Treaty Organization, the Shanghai Cooperation Organization and the CIS. We are willing to consider much greater participation in the relief operation for the Afghan people but only on the condition that the international contingent in Afghanistan acts with greater zeal and in our interests, that it will pursue the physical destruction of drug crops and underground laboratories. Invigorated anti-drug measures inside Afghanistan must be accompanied by the reliable blocking of the routes of opiate transportation to external markets, financial flows and the supply of chemical substances used in heroin production. The goal is to build a comprehensive system of antidrug security in the region. Russia will contribute to the effective cooperation of the international community for turning the tide in the war against the global drug threat. It is hard to predict further developments in Afghanistan. Historical experience shows that foreign military presence has not brought it serenity. Only the Afghans can resolve their own problems. I see Russia's role as follows – to help the Afghan people, with the active involvement of other neighboring countries, to develop a sustainable economy and enhance the ability of the national armed forces to counter the threats of terrorism and drug-related crime. We do not object to the process of national reconciliation being joined by participants of the armed opposition, including the Taliban, on condition they renounce violence, recognize the country's Constitution and sever ties with al-Qaeda and other terrorist groups. In principle, I believe it is possible to build a peaceful, stable, independent and neutral Afghan state. The instability that has persisted for years and decades is creating a breeding ground for international terrorism that is universally recognized as one of the most dangerous challenges to the world community. I'd like to note that the crises zones that engender a terrorist threat are located near the Russian borders and are much close to us than to our European or American partners. The United Nations has adopted the Global Counter-Terrorism Strategy but it seems that the struggle against this evil is conducted not under a common universal plan and not consistently but in a series of responses to the most urgent and barbarian manifestations of terror – when the public uproar over the impudent acts of terrorists grows out of proportion. The civilized world must not wait for tragedies like the terrorist attacks in New York in September 2001 or another Beslan disaster and only then act collectively and resolutely after the shock of such cases. I'm far from denying the results achieved in the war on international terror. There has been progress. In the last few years security services and the law-enforcement agencies of many countries have markedly upgraded their cooperation. But there is still the obvious potential for further anti-terrorist cooperation. Thus, double standards still exist and terrorists are perceived differently in different countries – some are "bad guys" and others are "not so bad." Some forces are not averse to using the latter in political manipulation, for example, in shaking up objectionable ruling regimes. All available public institutions – the media, religious associations, NGOs, the education system, science and business – must be used to prevent terrorism all over the world. We need a dialogue between religions and, on a broader plane, among civilizations. Russia has many religions, but we have never had religious wars. We could make a contribution to an international discussion on this issue. One of our country's neighbors is China, a major hub of the global economy. It has become fashionable to opine about that country's future role in the global economy and international affairs. Last year China moved into second place in the world in terms of GDP and it is poised to surpass the U.S. on that count, according to international – including American – experts. The overall might of the People's Republic of China is growing, and that includes the ability to project power in various regions. How should we conduct ourselves in the face of the rapidly strengthening Chinese factor? First of all, I am convinced that China's economic growth is by no means a threat, but a challenge that carries colossal potential for business cooperation – a chance to catch the Chinese wind in the sails of our economy. We should seek to more actively form new cooperative ties, combining the technological and productive capabilities of our two countries and tapping China's potential – judiciously, of course – in order to develop the economy of Siberia and the Russian Far East. Second, China's conduct on the world stage gives no grounds to talk about its aspirations to dominance. The Chinese voice in the world is indeed growing ever more confident, and we welcome that, because Beijing shares our vision of the emerging equitable world order. We will continue to support each other in the international arena, to work together to solve acute regional and global problems, and to promote cooperation within the UN Security Council, BRICS, the SCO, the G20 and other multilateral forums. And third, we have settled all the major political issues in our relations with China, including the critical border issue. Our nations have created a solid mechanism of bilateral ties, reinforced by legally binding documents. There is an unprecedentedly high level of trust between the leaders of our two countries. This enables us and the Chinese to act in the spirit of genuine partnership, rooted in pragmatism and respect for each other's interests. The model of Russian-Chinese relations we have created has good prospects. Of course, this is not suggest that our relationship with China is problem-free. There are some sources of friction. Our commercial interests in third countries by no means always coincide, and we are not entirely satisfied with the emerging trade structure and the low level of mutual investments. We will also closely monitor immigration from the People's Republic of China. But my main premise is that Russia needs a prosperous and stable China, and I am convinced that China needs a strong and successful Russia. Another rapidly growing Asian giant is India. Russia has traditionally enjoyed friendly relations with India, which the leaders of our two countries have classified as a privileged strategic partnership. Not only our countries but the entire multipolar system that is emerging in the world stands to gain from this partnership. We see before our eyes not only the rise of China and India, but the growing weight of the entire Asia-Pacific Region. This has opened up new horizons for fruitful work within the framework of the Russian chairmanship of APEC. In September of this year we will host a meeting of its leaders in Vladivostok. We are actively preparing for it, creating modern infrastructure that will promote the further development of Siberia and the Russian Far East and enable our country to become more involved in the dynamic integration processes in the "new Asia." We will continue to prioritize our cooperation with our BRICS partners. That unique structure, created in 2006, is a striking symbol of the transition from a unipolar world to a more just world order. BRICS brings together five countries with a population of almost three billion people, the largest emerging economies, colossal labor and natural resources and huge domestic markets. With the addition of South Africa, BRICS acquired a truly global format, and it now accounts for more than 25% of world GDP. We are still getting used to working together in this format. In particular, we have to coordinate better on foreign policy matters and work together more closely at the UN. But when BRICS is really up and running, its impact on the world economy and politics will be considerable. In recent years, cooperation with the countries of Asia, Latin America and Africa has become a growing focus of Russian diplomacy and of our business community. In these regions there is still sincere goodwill toward Russia. One of the key tasks for the coming period, in my view, is cultivating trade and economic cooperation as well as joint projects in the fields of energy, infrastructure, investment, science and technology, banking and tourism. The growing role of Asia, Latin America and Africa in the emerging democratic system of managing the global economy and global finance is reflected in the work of the G20. I believe that this association will soon become a strategically important tool not only for responding to crises, but for the long-term reform of the world's financial and economic architecture. Russia will chair the G20 in 2013, and we must use this opportunity to better coordinate the work of the G20 and other multilateral structures, above all the G8 and, of course, the UN. Russia is an inalienable and organic part of Greater Europe and European civilization. Our citizens think of themselves as Europeans. We are by no means indifferent to developments in united Europe. That is why Russia proposes moving toward the creation of a common economic and human space from the Atlantic to the Pacific Ocean – a community referred by Russian experts to as "the Union of Europe," which will strengthen Russia's potential and position in its economic pivot toward the "new Asia." Against the background of the rise of China, India and other new economies, the financial and economic upheavals in Europe – formerly an oasis of stability and order – is particularly worrisome. The crisis that has struck the eurozone cannot but affect Russia's interests, especially if one considers that the EU is our major foreign economic and trade partner. Likewise, it is clear that the prospects of the entire global economic structure depend heavily on the state of affairs in Europe. Russia is actively participating in the international effort to support the ailing European economies, and is consistently working with its partners to formulate collective decisions under the auspices of the IMF. Russia is not opposed in principle to direct financial assistance in some cases. At the same time I believe that external financial injections can only partially solve the problem. A true solution will require energetic, system-wide measures. European leaders face the task of effecting large-scale transformations that will fundamentally change many financial and economic mechanisms to ensure genuine budget discipline. We have a stake in ensuring a strong EU, as envisioned by Germany and France. It is in our interests to realize the enormous potential of the Russia-EU partnership. The current level of cooperation between Russia and the European Union does not correspond to current global challenges, above all making our shared continent more competitive. I propose again that we work toward creating a harmonious community of economies from Lisbon to Vladivostok, which will, in the future, evolve into a free trade zone and even more advanced forms of economic integration. The resulting common continental market would be worth trillions of euros. Does anyone doubt that this would be a wonderful development, and that it would meet the interests of both Russians and Europeans? We must also consider more extensive cooperation in the energy sphere, up to and including the formation of a common European energy complex. The Nord Stream gas pipeline under the Baltic Sea and the South Stream pipeline under the Black Sea are important steps in that direction. These projects have the support of many governments and involve major European energy companies. Once the pipelines start operating at full capacity, Europe will have a reliable and flexible gas-supply system that does not depend on the political whims of any nation. This will strengthen the continent's energy security not only in form but in substance. This is particularly relevant in the light of the decision of some European states to reduce or renounce nuclear energy. The Third Energy Package, backed by the European Commission and aimed at squeezing out integrated Russian companies, is frankly not conducive to stronger relations between Russia and the EU. Considering the growing instability of energy suppliers that could act as an alternative to Russia, the package aggravates the systemic risks to the European energy sector and scares away potential investors in new infrastructure projects. Many European politicians have been critical of the package in their talks with me. We should summon the courage to remove this obstacle to mutually beneficial cooperation. I believe that genuine partnership between Russia and the European Union is impossible as long as there are barriers that impede human and economic contacts, first and foremost visa requirements. The abolition of visas would give powerful impetus to real integration between Russia and the EU, and would help expand cultural and business ties, especially between medium-sized and small businesses. The threat to Europeans from Russian economic migrants is largely imagined. Our people have opportunities to put their abilities and skills to use in their own country, and these opportunities are becoming ever more numerous. In December 2011 we agreed with the EU on "joint steps" toward a visa-free regime. They can and should be taken without delay. We should continue to actively pursue this goal. I recently had a talk with Henry Kissinger. I meet with him regularly. I fully share this consummate professional's thesis that close and trusting interactions between Moscow and Washington are particularly important in periods of international turbulence. In general, we are prepared to make great strides in our relations with the U.S., to achieve a qualitative breakthrough, but on the condition that the Americans are guided by the principles of equal and mutually respectful partnership. In December of last year, Russia finally concluded its marathon accession to the WTO, which lasted for many years. I must mention that, in the finishing stretch, the Obama administration and the leaders of some major European states made a significant contribution to achieving the final accords. To be honest, at times during this long and arduous journey we wanted to turn our backs on the talks and slam the door. But we did not succumb to emotion. As a result a compromise was reached that is quite acceptable for our country: we managed to defend the interests of Russian industrial and agricultural producers in the face of growing external competition. Our economic actors have gained substantial additional opportunities to enter world markets and uphold their rights there in a civilized manner. It is this, rather than the symbolism of Russia's accession to the World Trade "club", that I see as the main result of this process. 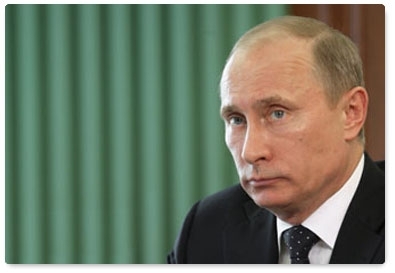 Russia will comply with WTO norms, as it meets all of its international obligations. Likewise, I hope that our partners will play according to the rules. Let me note in passing that we have already integrated WTO principles in the legal framework of the Common Economic Space of Russia, Belarus and Kazakhstan. Russia is still learning how to systematically and consistently promote its economic interests in the world. We have yet to learn, as many Western partners have, how to lobby for decisions that favor Russian business in foreign international forums. The challenges facing us in this area, given our priority of innovation-driven development, are very serious: to achieve equal standing for Russia in the modern system of global economic ties, and to minimize the risks arising from integration in the world economy, including Russia's membership in the WTO and its forthcoming accession to the OECD. We are badly in need of broader, non-discriminatory access to foreign markets. So far Russian economic actors have been getting a raw deal abroad. Restrictive trade and political measures are being taken against them, and technical barriers are being erected that put them at a disadvantage compared with their competitors. The same holds for investments. We are trying to attract foreign capital to the Russian economy. We are opening up the most attractive areas of our economy to foreign investors, granting them access to the "juiciest morsels," in particular, our fuel and energy complex. But our investors are not welcome abroad and are often pointedly brushed aside. Examples abound. Take the story of Germany's Opel, which Russian investors tried and failed to acquire despite the fact that the deal was approved by the German government and was positively received by German trade unions. Or take the outrageous examples of Russian businesses being denied their rights as investors after investing considerable resources in foreign assets. This is a frequent occurrence in Central and Eastern Europe. All this leads to the conclusions that Russia must strengthen its political and diplomatic support for Russian entrepreneurs in foreign markets, and to provide more robust assistance to major, landmark business projects. Nor should we forget that Russia can employ identical response measures against those who resort to dishonest methods of competition. The government and business associations should better coordinate their efforts in the foreign economic sphere, more aggressively promote the interests of Russian business and help it to open up new markets. I would like to draw attention to another important factor that largely shapes the role and place of Russia in present-day and future political and economic alignments – the vast size of our country. Granted, we no longer occupy one-sixth of the Earth's surface, but the Russian Federation is still the world's largest nation with an unrivaled abundance of natural resources. I am referring not only to oil and gas, but also our forests, agricultural land and clean freshwater resources. Russia's territory is a source of its potential strength. In the past, our vast land mainly served as a buffer against foreign aggression. Now, given a sound economic strategy, they can become a very important foundation for increasing our competitiveness. I would like to mention, in particular, the growing shortage of fresh water in the world. One can foresee in the near future the start of geopolitical competition for water resources and for the ability to produce water-intensive goods. When this time comes, Russia will have its trump card ready. We understand that we must use our natural wealth prudently and strategically. Respect for one's country is rooted, among other things, in its ability to protect the rights of its citizens abroad. We must never neglect the interests of the millions of Russian nationals who live and travel abroad on vacation or on business. I would like to stress that the Foreign Ministry and all diplomatic and consular agencies must be prepared to provide real support to our citizens around the clock. Diplomats must respond to conflicts between Russian nationals and local authorities, and to incidents and accidents in a prompt manner – before the media announces the news to the world. We are determined to ensure that Latvian and Estonian authorities follow the numerous recommendations of reputable international organizations on observing generally accepted rights of ethnic minorities. We cannot tolerate the shameful status of "non-citizen." How can we accept that, due to their status as non-citizens, one in six Latvian residents and one in thirteen Estonian residents are denied their fundamental political, electoral and socioeconomic rights and the ability to freely use Russian? The recent referendum in Latvia on the status of the Russian language again demonstrated to the international community how acute this problem is. Over 300,000 non-citizens were once again barred from taking part in a referendum. Even more outrageous is the fact that the Latvian Central Electoral Commission refused to allow a delegation from the Russian Public Chamber to monitor the vote. Meanwhile, international organizations responsible for compliance with generally accepted democratic norms remain silent. On the whole, we are dissatisfied with how the issue of human rights is handled globally. First, the United States and other Western states dominate and politicize the human rights agenda, using it as a means to exert pressure. At the same time, they are very sensitive and even intolerant to criticism. Second, the objects of human rights monitoring are chosen regardless of objective criteria but at the discretion of the states that have "privatized" the human rights agenda. Russia has been the target of biased and aggressive criticism that, at times, exceeds all limits. When we are given constructive criticism, we welcome it and are ready to learn from it. But when we are subjected, again and again, to blanket criticisms in a persistent effort to influence our citizens, their attitudes, and our domestic affairs, it becomes clear that these attacks are not rooted in moral and democratic values. Nobody should possess complete control over the sphere of human rights. Russia is a young democracy. More often than not, we are too humble and too willing to spare the self-regard of our more experienced partners. Still, we often have something to say, and no country has a perfect record on human rights and basic freedoms. Even the older democracies commit serious violations, and we should not look the other way. Obviously, this work should not be about trading insults. All sides stand to gain from a constructive discussion of human rights issues. In late 2011, the Russian Foreign Ministry published its first report on the observance of human rights in other countries. I believe we should become more active in this area. This will facilitate broader and more equitable cooperation in the effort to solve humanitarian problems and promote fundamental democratic principles and human rights. Of course, this is just one aspect of our efforts to promote our international and diplomatic activity and to foster an accurate image of Russia abroad. Admittedly, we have not seen great success here. When it comes to media influence, we are often outperformed. This is a separate and complex challenge that we must confront. Russia has a great cultural heritage, recognized both in the West and the East. But we have yet to make a serious investment in our culture and its promotion around the world. The surge in global interest in ideas and culture, sparked by the merger of societies and economies in the global information network, provides new opportunities for Russia, with its proven talent for creating cultural objects. Russia has a chance not only to preserve its culture but to use it as a powerful force for progress in international markets. The Russian language is spoken in nearly all the former Soviet republics and in a significant part of Eastern Europe. This is not about empire, but rather cultural progress. Exporting education and culture will help promote Russian goods, services and ideas; guns and imposing political regimes will not. We must work to expand Russia's educational and cultural presence in the world, especially in those countries where a substantial part of the population speaks or understands Russian. We must discuss how we can derive the maximum benefit for Russia's image from hosting large international events, including the APEC Leaders' Meeting in 2012, the G20 summit in 2013 and the G8 summit in 2014, the Universiade in Kazan in 2013, the Winter Olympic Games in 2014, the IIHF World Championships in 2016, and the FIFA World Cup in 2018. Russia intends to continue promoting its security and protecting its national interest by actively and constructively engaging in global politics and in efforts to solve global and regional problems. We are ready for mutually beneficial cooperation and open dialogue with all our foreign partners. We aim to understand and take into account the interests of our partners, and we ask that our own interests be respected.